I have a new artist that I have been following and I feel like I just have to make a post of my thoughts on his works. What’s interesting is that I received a print of his from a friend who worked the Corn Hill Art Festival in New York. I had the print framed and placed it in my dining room. Long story short I enjoyed the painting so much and continued to wonder who the artist was. I didn’t realize that all of the information that I needed was actually on this poster. I went to his website and discovered a new world of paintings that I absolutely fell in love with. I have become completely obsessed with his work and would give anything to have all of his paintings and prints for my house. Let’s get back to the artist. His name is Cordell Cordaro and he is what I as well as others, the modern Toulouse Letrec. His works are heavily influenced by Letrec’s style of painting but of course with his own unique twist. Cordaro captures images of the social scene. Many of his paintings capture a scene from a social gatherings with men and women in bold and colorful clothing. 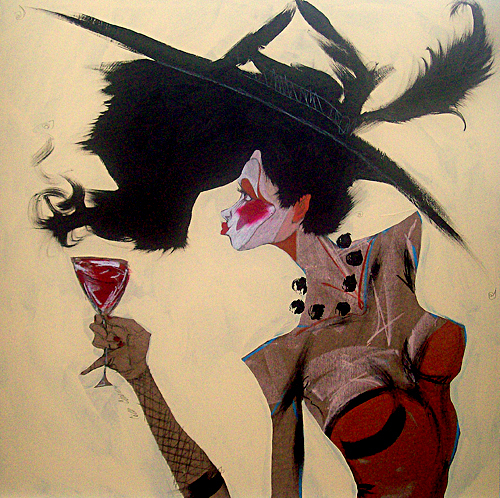 Cordero expresses a mastery of the female form many of his works that I observed often show women in very avante-garde fashions with beautiful colors and poses, again capturing that essence of being seen in the public eye. I like that he captures these themes as I am a photographer myself and do mostly fashion photography. I enjoy an artist who captures subject matters that are relateable but on top of that who can show such great work from past influences, but keeping it modern to today’s style. I really enjoy that he takes the time to put so much detailing into the works as well as reaching outside of the normal and expressing his creativity. That is after all what art is all about right? Cordell Cordero’s works are all amazing and I just love when I come across an artist that portrays areas of interest that I have and just captures me. I am also glad to see that his works are being well received. I wish that I could get to East Coast soon to see one of his shows. Below is a link to his website as well as some images. I hope that you all enjoy as much as I do. Excellent way to describe his Art! I was searching for a ‘logo’ to brand my buisness. SOCIAL BUTTERFLY~~A wedding and event planning business. I found one of his pieces and it spoke volumes! I too, want a collection of his work. A great artist. His works are amazing. I must figure out a way to get to one of his shows.